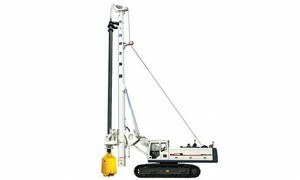 - Adopt the hydraulic retractable track chassis special for the rotary drilling rig, which meets the stability and the convenience of the transportation. – Adopt imported Cummins engine with strong power and enough power reserve, which can meet the highland construction. The noise and emission meet the standard of Europe III. – The patent parallelogram variable structure realizes the large-scope working area. The whole variable system is made of high-intensity materials, which has strong stability, ensures the mast moving stably, and makes the drilling tool position accurately and not affect the verticality. All the articulated joints of the variable system adopt the lubrication-free bearing which can rotate freely. – The hydraulic system adopts the load sensing technology, which improves the efficiency of the hydraulic system and saves the energy. – It can be installed with many kinds of drilling tools, realizing both dry and wet drilling work which can be applied to the concrete pile drilling construction of many kinds of foundations. The drill rod adopts lock or friction drag retractable structure, and transmits torque to the drilling tools through the claw or friction plate, which has big transmission torque and high efficiency. – The main winch steel wire rope adopts single winding, which is convenient to operate, and greatly improves the service life of the steel wire rope. There is drilling depth detection device installed on the main winch. The single winding makes the depth detection more accurate, and is convenient to maintain. – The drill unit adopts the imported reducer and motor of international famous company, which have big drilling torque and high work efficiency. – Install the infrared camera to observe the service condition of the main hoist in the cab day and night.